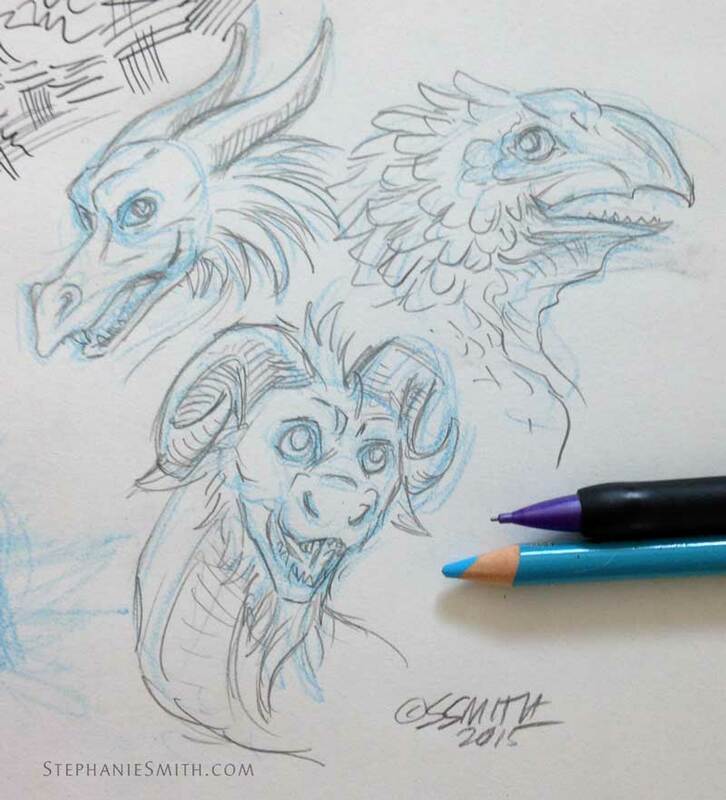 The first part of of my recent shopping expedition to the art store was about the non-brush pens. But the rest of my shopping basket was full of brush pens: self-contained pens designed to emulate using a small brush with ink. Why is that important? The technical pens I usually use are designed to make lines that are always the same width, but that’s not always the look I want. Due to having cats whose instincts are so refined that they believe they can walk across a glass-topped table that’s at a 45° angle (they can’t) using an actual open ink pot is out of the question unless I want to end every art session with a massive ink-spill clean-up. 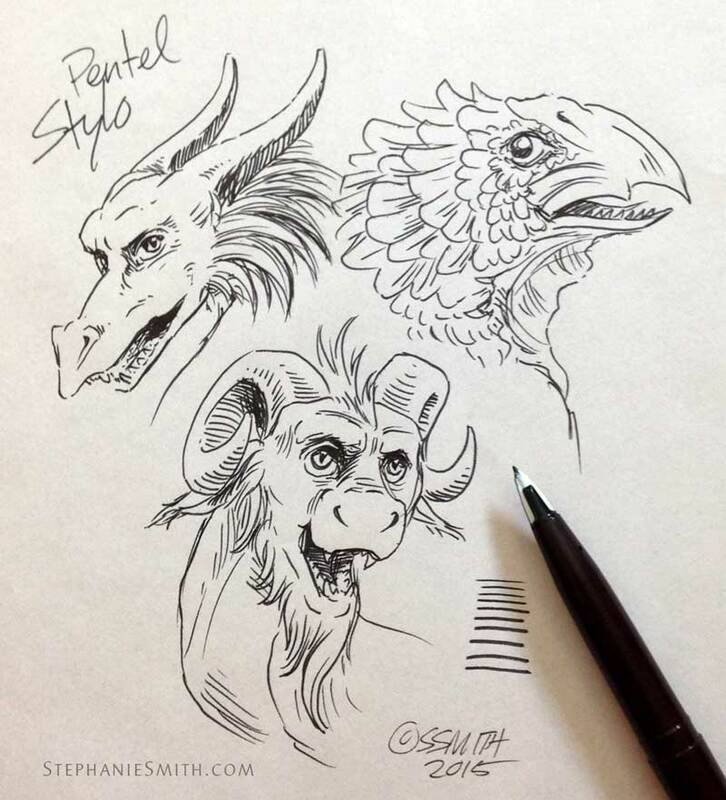 Fortunately I’m not the only one to have this issue, and for folks like me they’ve invented brush pens! So what did I try this time around? I’ve been using this pen quite a bit lately because of the issues I’m having with the Sakura Brush pens (losing their fine points quickly, fraying if I’m not careful, etc.) so I used it here as a benchmark for comparison. As you can see, it has a pretty wide range from wide to narrow, but it can difficult (not impossible!) to get extremely fine lines. Since it has a flexible solid fiber point, it can get mashed and damaged, but I’ve found it to be relatively sturdy. It’s easier to get extreme line variation by changing the angle and direction of the pen rather than pressing harder so the point bends, but in practice you’d do both. This was a new pen, so it wasn’t broken in very much and started out a bit on the stiff side. It’s very easy to control, but not as expressive as some others. Even though it’s classified as a brush pen it doesn’t handle much like a real brush, it always remains a bit stiff. 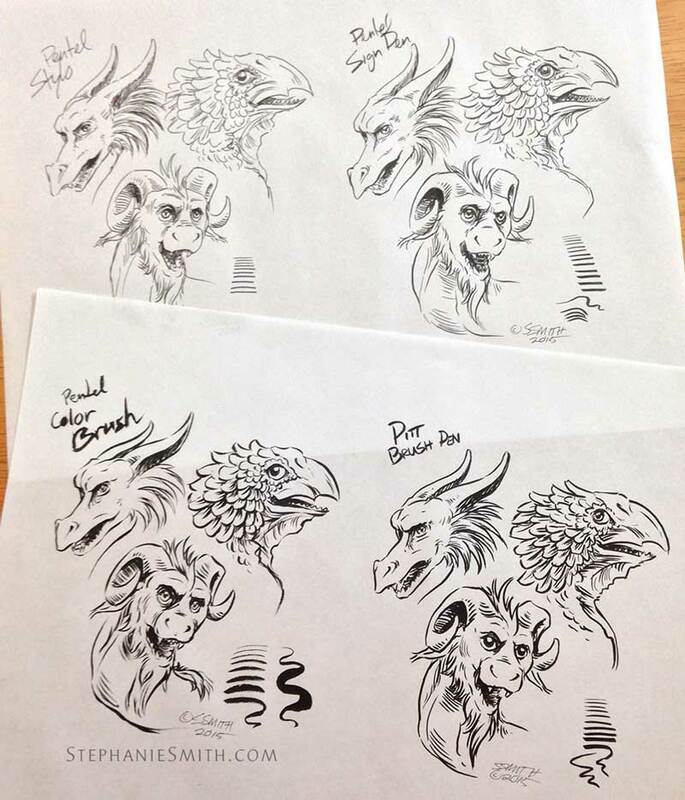 It uses a waterproof pigment ink so if I want to embellish with watercolor later I can do so without the ink lines bleeding or smearing. This one has become a familiar and comfortable go-to pen for me. 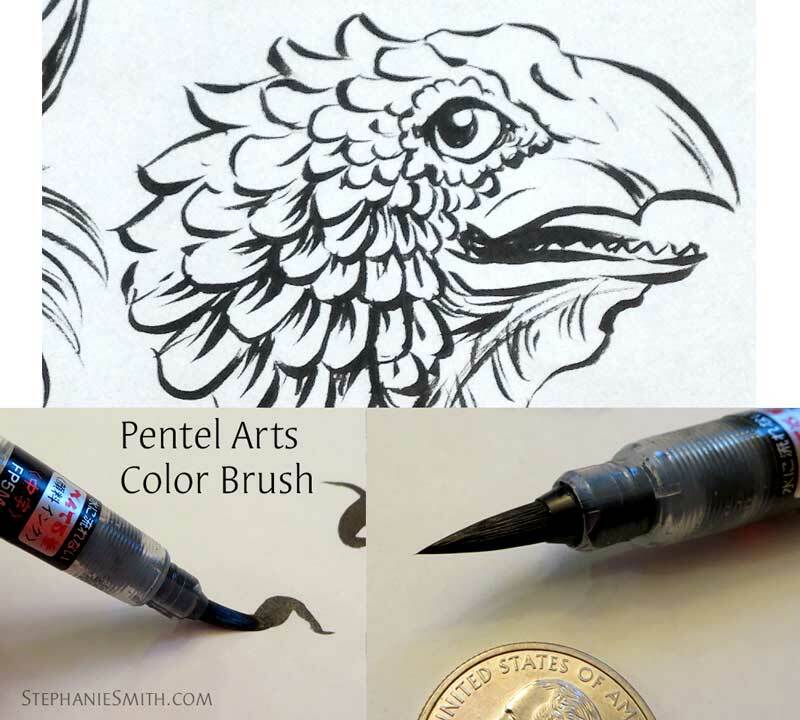 Unlike many brush pens, the brush is a “real” brush, made of fine synthetic hairs, instead of a solid felt or fiber nib… tho this may not be visible in my photographs. This particular model is not refillable, but I believe they make a refillable version. The brush is clearly the standout feature of this pen. I haven’t used an actual brush for a while, so I wasn’t sure how well I was going to handle this one. When I opened it my first reaction was “this brush is way to big for my drawing, it’s going to look completely blobby unless I draw something larger.” Boy was I wrong! 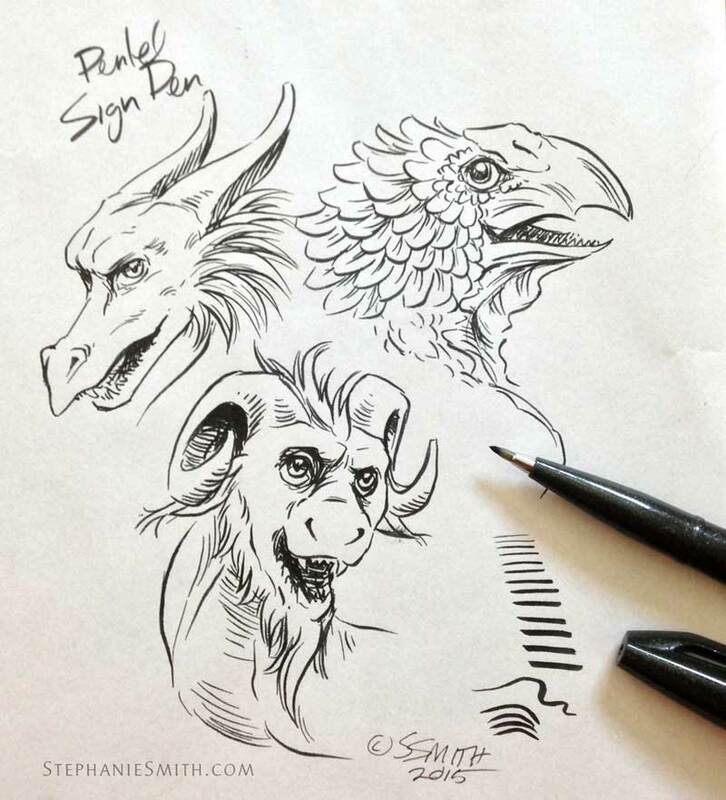 As you can see in the sketch lines above, it has an impressive range, making lines from very fine to wide, even in the same stroke, moreso than the brush pens with a solid nib. Right out of the box, the Color Brush’s synthetic fiber bristles were still white and clean. The pen has a ring to keep the ink inside the storage chamber during shipping, and once it’s removed you have to prime the brush a bit (squeezing the ink out) to saturate the bristles with ink. After just a little bit of doodling it created a smooth, even line. It seems like it’ll need just a bit of a squeeze to re-prime it every time I start using it. Even after pressing hard enough to make the widest lines the brush springs back very quickly to a fine point. 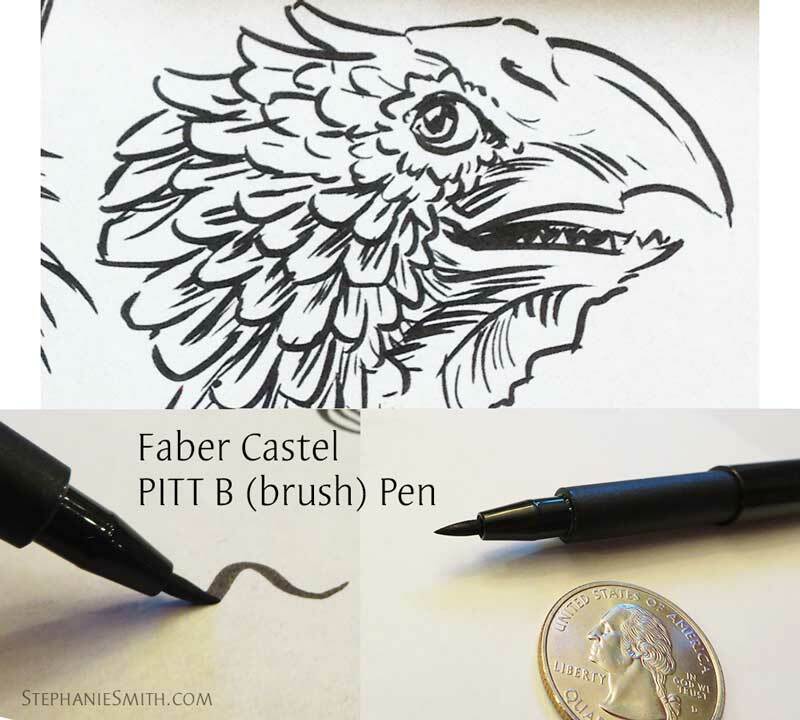 The bristles have just the right amount of give that it offers a lot of control, although it’s still a brush so there’s more wiggle to it than the more pen-like brush pens. This drawing was made mostly with the very tip of the pen with very little pressure, but didn’t need such a light touch that it was difficult to maintain. Using a very hard pressure, it was difficult to maintain a clean, smooth line, so it’s not really something you can use as a mop brush, although it seems like it would do an ok job of filling large areas with solid black. With very little warm-up I was up and running, although I’ll need more practice to feel really proficient. 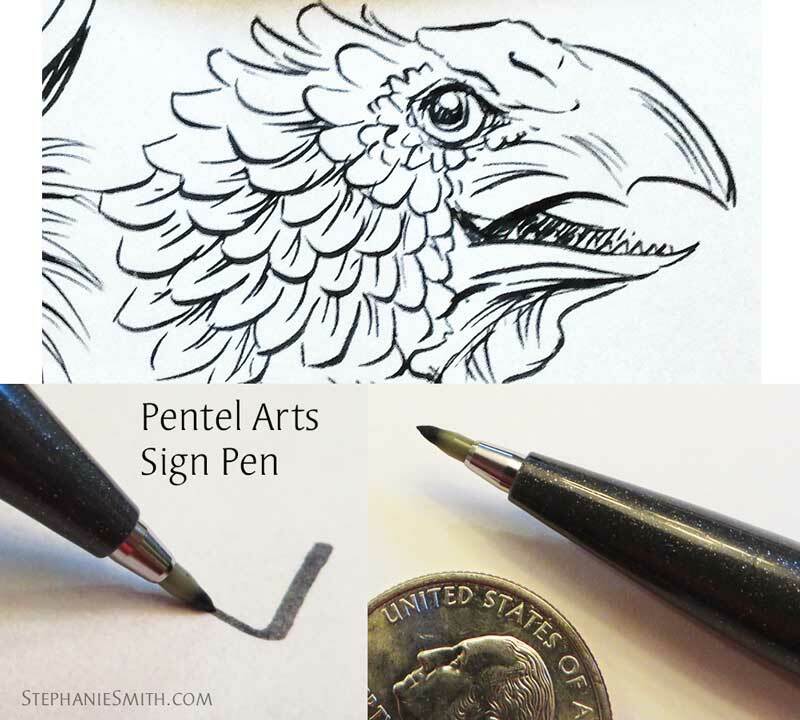 Ordinarily, I’d probably have switched to a technical pen or solid-nib pen for tiny details like the pupils of the eyes — and definitely the lettering! — but I wanted to push my limits. I’m really enjoying this brush, and have been wanting to find a good way to use more real brush-work in my drawing. 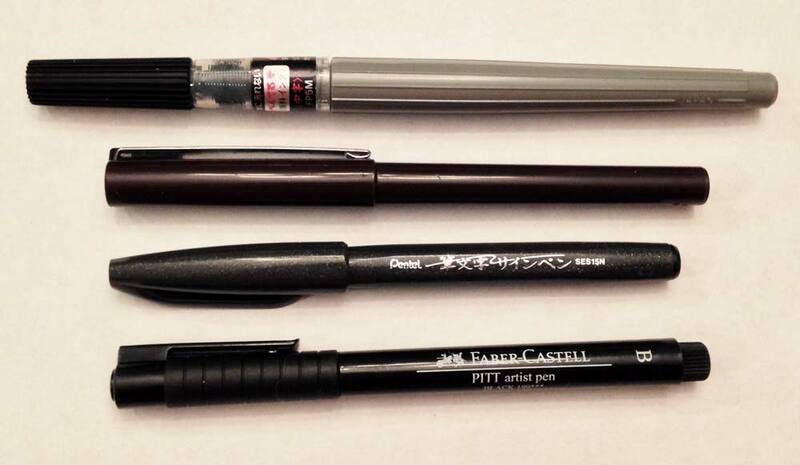 However, because of the flexibility of the barrel I’d be reluctant to just chuck it into my travel bag like some of my other pens for fear it will become damaged or waste ink. I’ll be practicing more with this one! 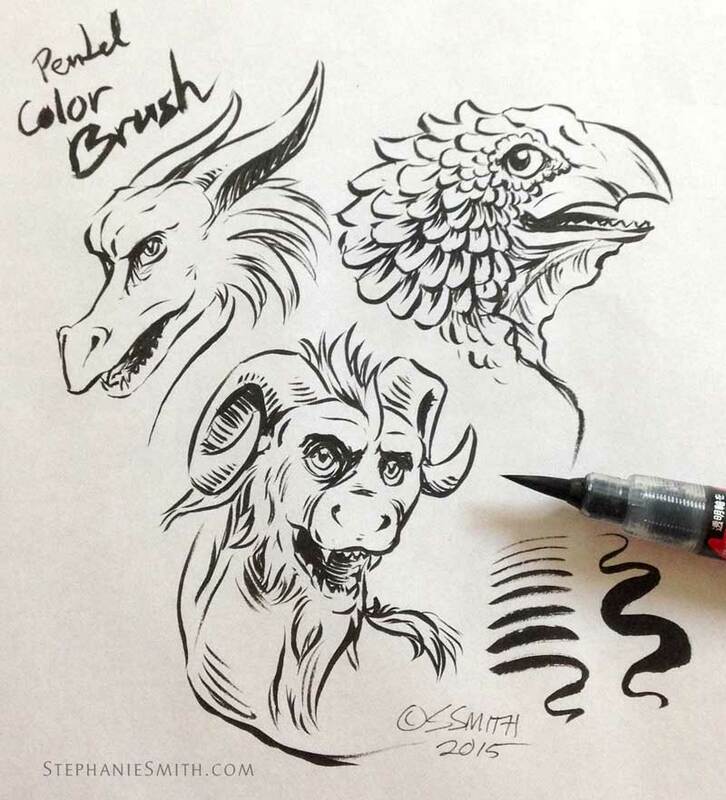 Pentel Arts makes several different brush pens, all with different qualities and features. I picked up a couple more in this same shopping trip, but haven’t opened them all yet, for fear they’ll dry out. But I’m looking forward to trying them all! 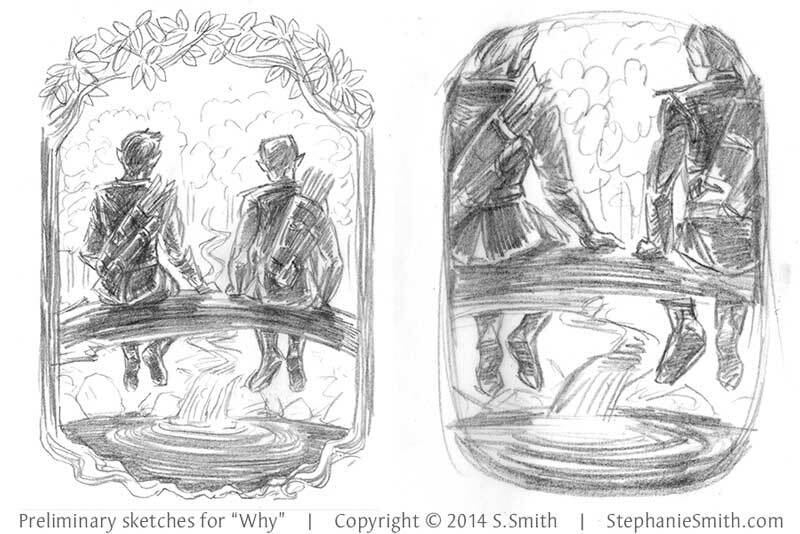 When we left off at the end of Part 1, I had a client-approved layout sketch and color scheme. Now it’s time to turn that into a real book cover! 2. Part of the time I’d be working on this, I’d be traveling. Keeping everything digital meant that all I had to bring with me was my laptop and drawing tablet instead of a bag of art supplies. For digital artwork I typically use the Adobe products — mostly Photoshop but others as needed — and a Wacom Intuos drawing tablet. 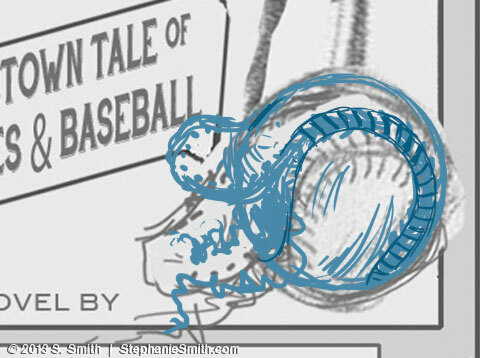 First, I opened my sketch in Photoshop and used the drawing tools to redraw sections of my source drawing that I wasn’t happy with, like this baseball. 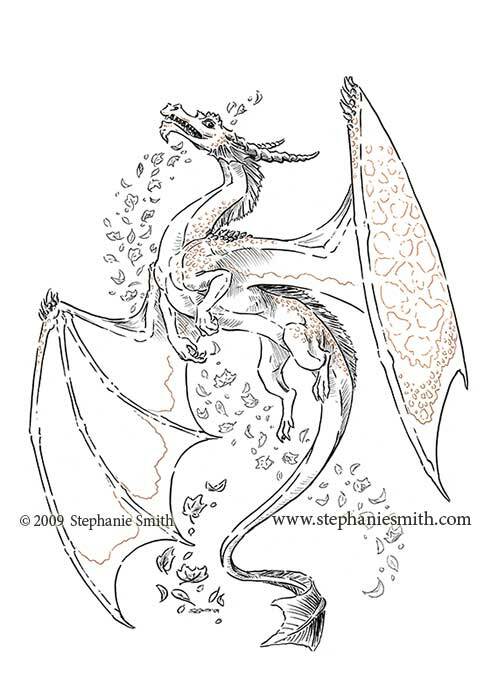 Then, on another layer, I drew in the linework, just as I would have with a real pen. This is the final version; I didn’t take screenshots as I went along, so I had to go into the different finished layers to pull out the samples for this article. Which means you don’t get to see all the erasing and redrawing and erasing and redrawing etc etc… lucky you! Finally, on a layer that went underneath all the others, I filled in a flat area of color and then added shading. Each element of the illustration was drawn separately and then all the layers grouped together in a “smart object” so they’d be easy to resize, move around, and add effects to. Once I had all the hand-drawn parts finished, I started in on the frame. 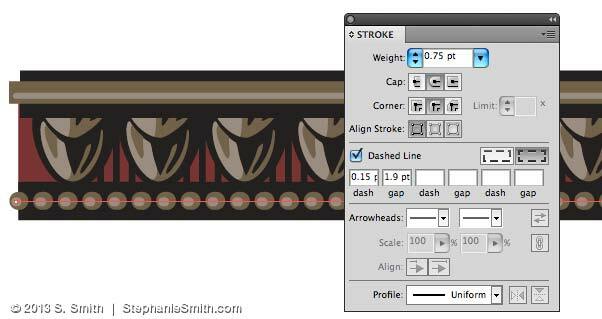 I couldn’t find any patterns that would work 100% from my clip-art collection, so I built my own in Illustrator. This program makes it easier to make geometric shapes and build repeating patterns, so after I figured out the basic shape I wanted, I drew it in Adobe Illustrator and turned it into a symbol that could be copied as many times as I needed. 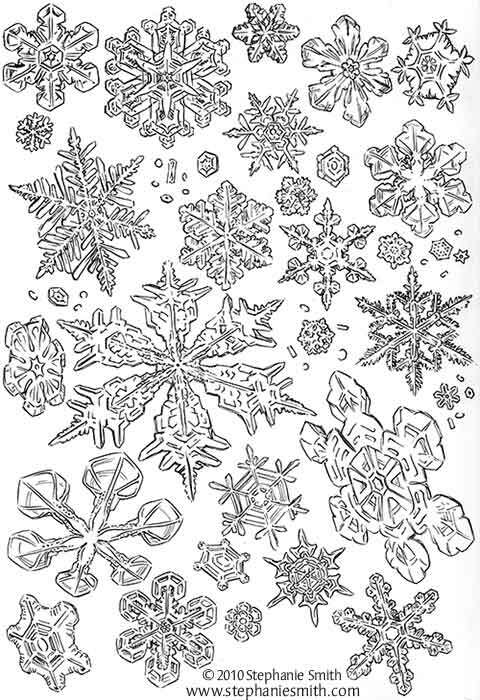 Other details were drawn in, including using the “dashed line” feature to make these little raised dots. There were a couple other elements that proved easier to draw in Illustrator, like the picture frames in the corner, and the banner for the subtitle. 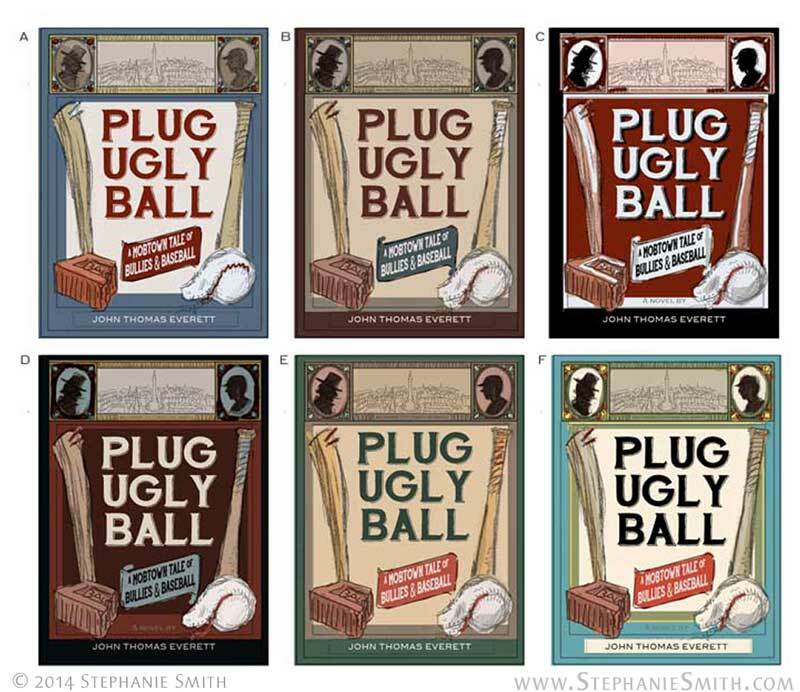 All of these pieces were then copied into my Photoshop file as Smart Objects, just in case I needed to open them again in Illustrator to make changes — and boy did I! Here, the images on the left are in Illustrator and the last image on the right is in Photoshop, where you can see here how I’ve started layering in textures so it doesn’t look too crisp and clean. As the artwork started coming together — including adding the text (the font is the lovely HandShop from Fontscafe) — I needed to adjust some of the proportions and positions. Now that I have all of the main pieces of artwork done, it may seem like it’s pretty much finished, but now it’s time for all the details that really make the cover come together: textures, shadows, shading, and other adjustments. But those will have to wait for the next installment! UPDATE: Continue the story with Part 3! 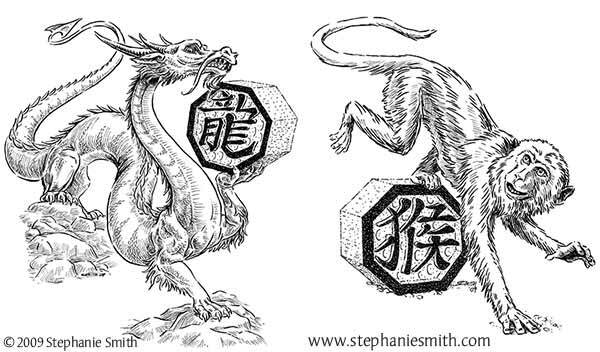 This recent commission was for a black-and-white image to be used as the cover for a short fantasy story, “Why,” written by Maggie Allen for author Janine Spendlove and published by the creator-run Silence in the Library Publishing as part of a Kickstarter backer bonus. 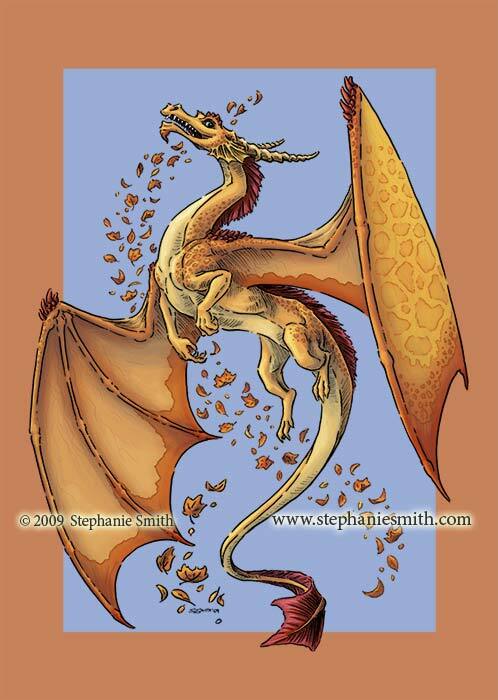 The story is a bittersweet character study that takes place in Spendlove’s “War of the Seasons” fantasy universe. I worked with both Maggie and Janine to make sure I captured the style and spirit of the characters and setting. 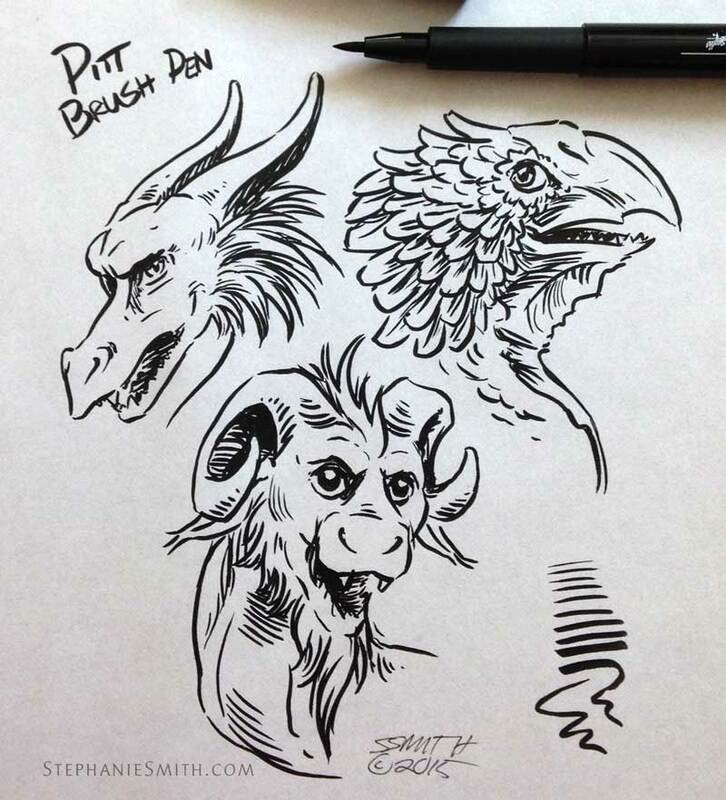 For this drawing, I used the Pitt brush pen. I needed to work quickly and the brush pen is a good compromise between detail and speed. Although I used my light table to trace from the sketch, you can see in this picture where I made a few final adjustments in blue pencil before committing the drawing to ink. Want to see the final product? Head on over to my Behance page! That’s where new finished artwork will be showing up, so if you’re a community member there Follow me to be updated when I add new work. 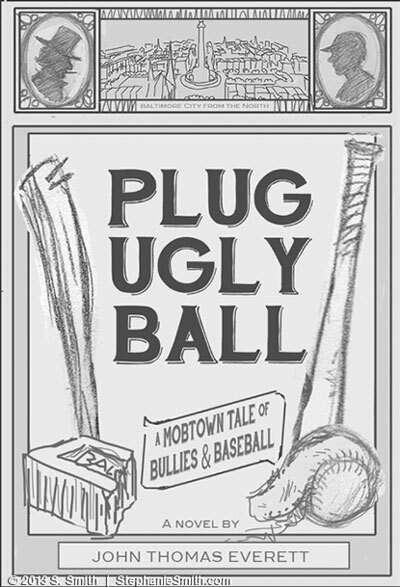 As followers of this blog know, I recently had the pleasure of illustrating the book Plug Ugly Ball: A Mobtown Tale of Bullies and Baseball, including the design of the book’s cover. 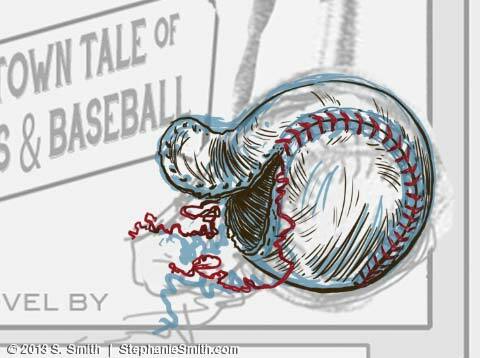 Here’s a little peek inside the process. 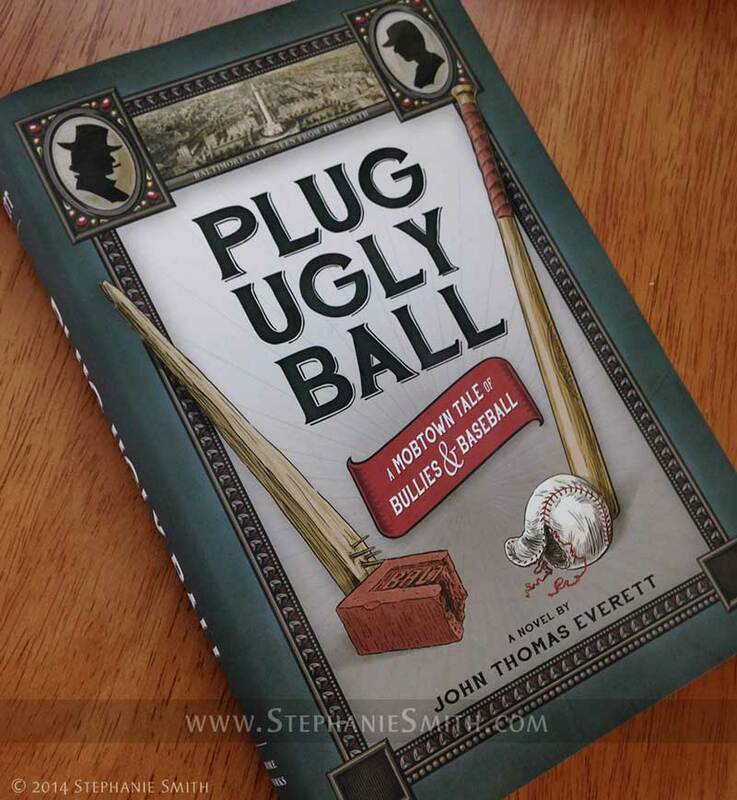 Like any other illustration or design project, this one started with a long conversation with the client (in this case, author John Everett) about what he needed and wanted. Since I had just completed the interior art for his book, I was already familiar with its subject matter and themes. My client wanted to be sure his cover evoked those same themes and the time period the story is set in: the late Victorian era in the American East. 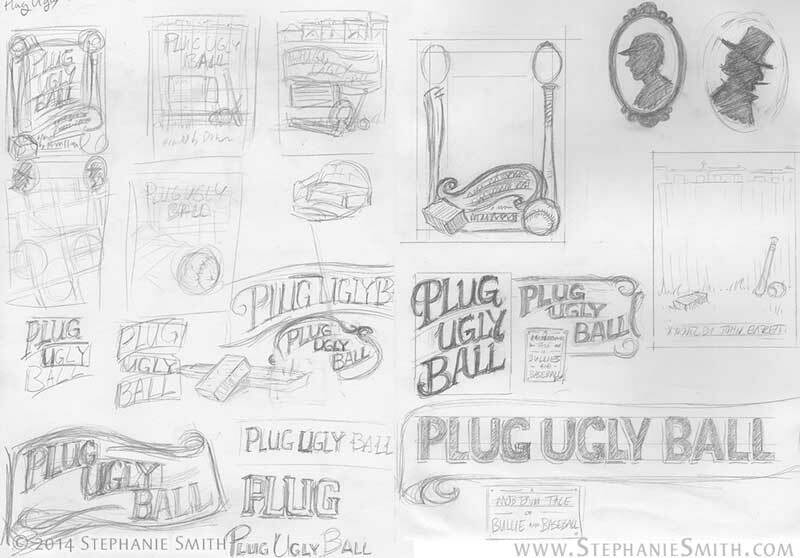 After a bit of additional historical and market research, I hit the sketchbook and filled up several pages with ideas about layout and typography, integrating some of the visual elements my client specifically wanted. 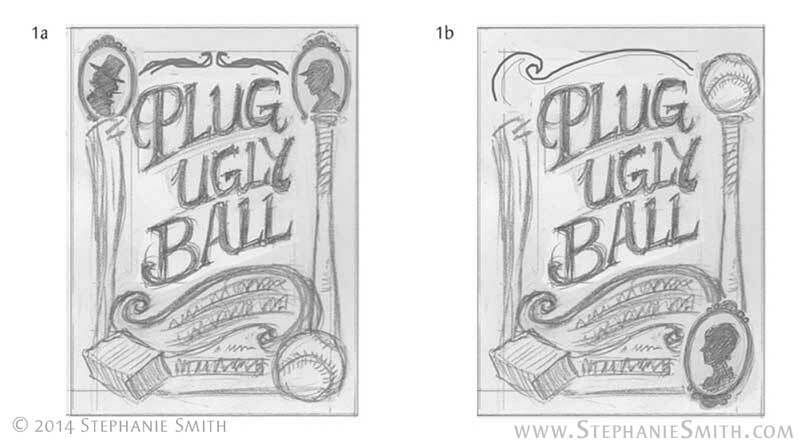 They included more formal, structured concepts similar to the printed matter of the time as well as more pictoral concepts built around the ballpark and painted outdoor signage. Taking into account current trends in book design and the need to avoid making it look like it belonged in the non-fiction section, I worked up four of the most likely ideas in rough form and sent them to my client. 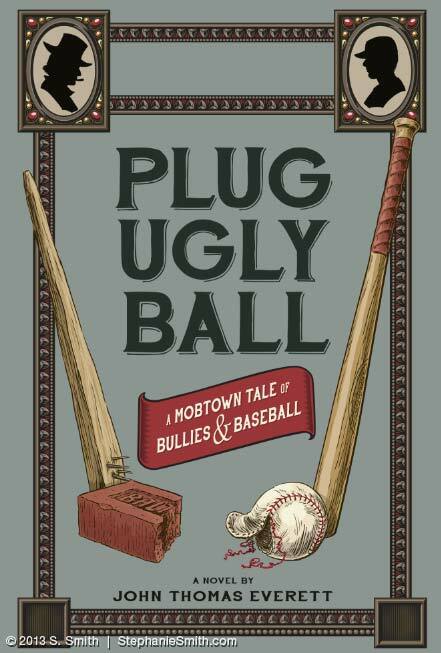 He wanted the cover to reflect the parallel in his story between the old Plug Ugly Gang and the rough-and-ready days of the early baseball league in Baltimore, so his favorite concept was the one that took that very literally, seen below on the left. With his comments in mind I refined the design further. Ultimately we included some period art of the city itself as an inset and a few visual motifs from the other versions I’d presented. As the design came together, I started integrating color, producing a set of different colorways for the client to pick from. Some of the palettes were authentic to the time period, pulled from vintage advertisements — they were more vivid options, in fact — while others just “feel” more antique to a modern viewer. Now that I had an approved design, it was time to start making the artwork. But that will have to wait for the next post! EDIT: Part Two is now online! 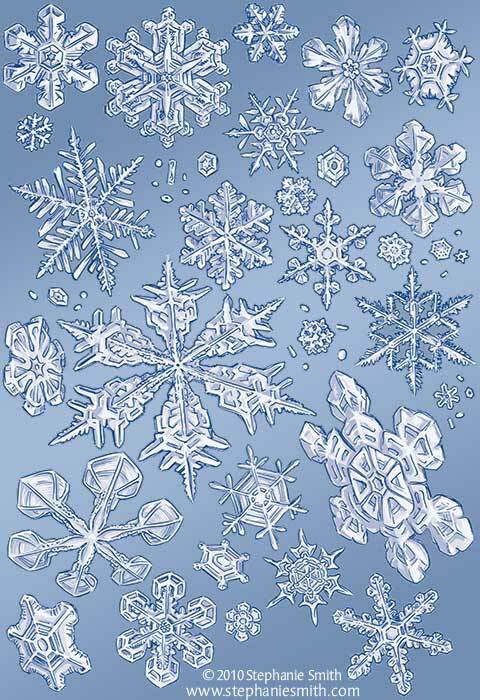 MORE snow? Only the good kind. Happy Thanksgiving! I hope everyone out there (whether or not you live in the US where it’s being formally and nationalistically observed) has a moment this week to spend with their family and/or friends and reflect on all of the good things in their life. I have quite a long list myself, including my wonderful extended family, all of my dear friends (both online and offline) and my dear husband and the life we’ve been building together. I love that I have the freedom to pursue my art and maintain a comfortable life at the same time, and am grateful for all of the blessings, large and small, that have filled my life. I just finished making pies for tomorrow’s dinner with my husband watching goofy old movie serials on our little kitchen TV and you know what? It’s a pretty good way to end the day. Especially taking into account that the rest of the day was spent cleaning the whole house because we’re hosting Thanksgiving dinner tomorrow. I don’t know about anyone else, but as much fun as I’ve had doing these (and they have been very fun) I will be happy when they’re done. I’m a bit eager to start in on the next project. I’ll be posting shiny new color versions of the whole series everywhere as soon as they’re done… with any luck in the next couple of weeks! Have a great holiday, those that are having one! 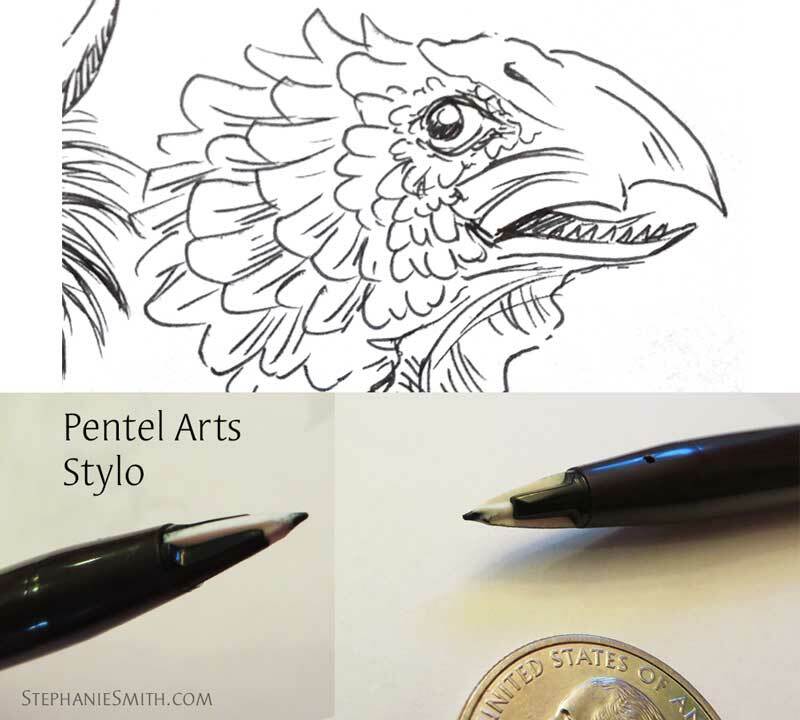 It’s been a busy week, but I wanted to post this little extra tidbit to follow on from last week’s post where I described the process I followed to make this image. Here are the same steps, now in fancy animated gif format. It might take a little while to load, so sit back and enjoy! To make up for the short break in my posting schedule, I have something a little extra today: a work-in-progress breakdown of how I produced my latest image. All of the images below can be clicked for a larger view. First, after figuring out most of the details in pencil first, I use my light table to help create the ink drawing. 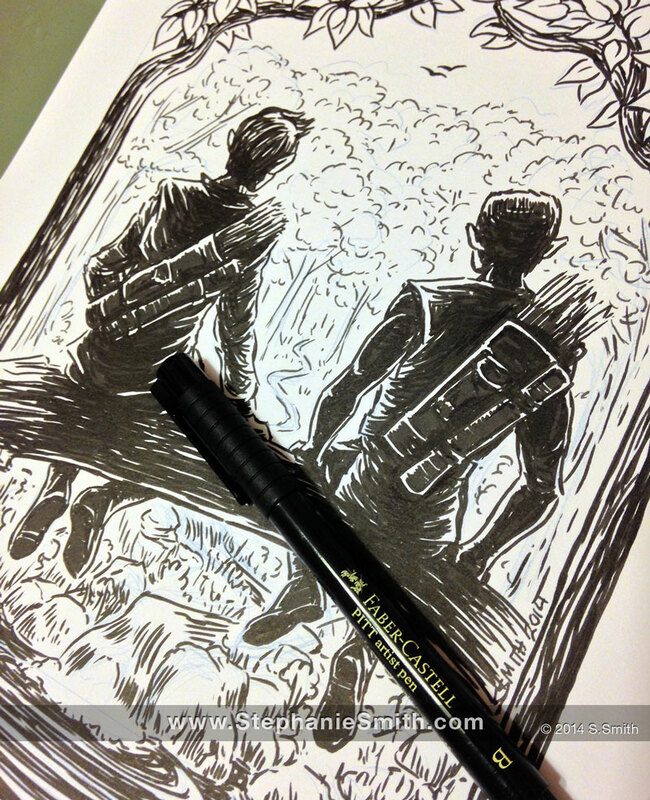 I’ve been using a brush-pen lately, using the fixed-width Micron pens only for the fine details. 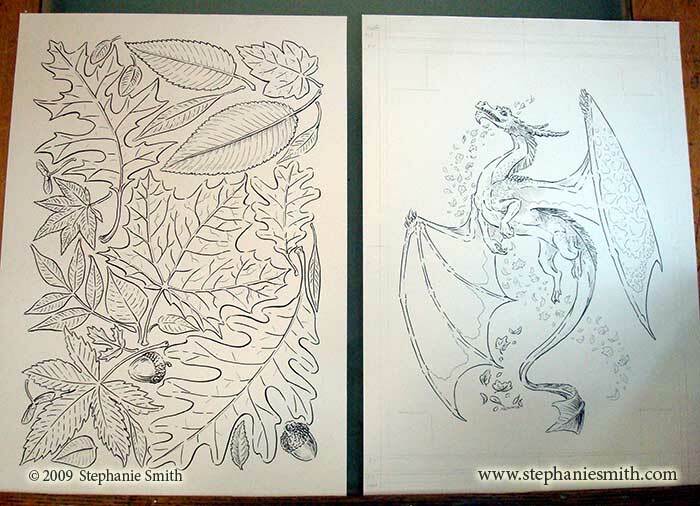 As you can see, the leaves were all drawn out separately, because I think I want to reuse them on a future project. Next the ink drawings are scanned in and cleaned up a bit in Photoshop. I worked on paper that was 17×12 inches because that’s the largest size that will fit on my scanner. My A3 scanner is my current favorite “toy” because it lets me draw larger without having to piece things together after scanning them in sections, saving me SO much time and hassle. Here you can see where I’ve tinted some of the lines where I wanted a more subtle effect. Next, I blocked in the color areas with flat colors. 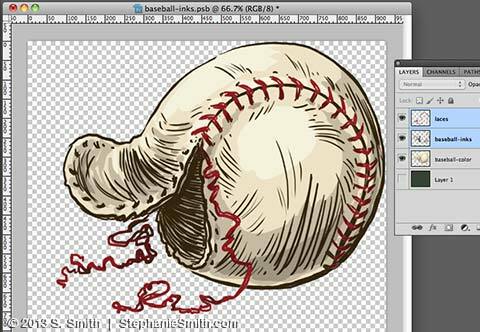 Doing this first simplifies things a lot later on, when I can use the wand tool to isolate different areas. Usually I put the ink drawing on a separate layer set to “multiply” so the white areas become invisible and color on the layer beneath it. 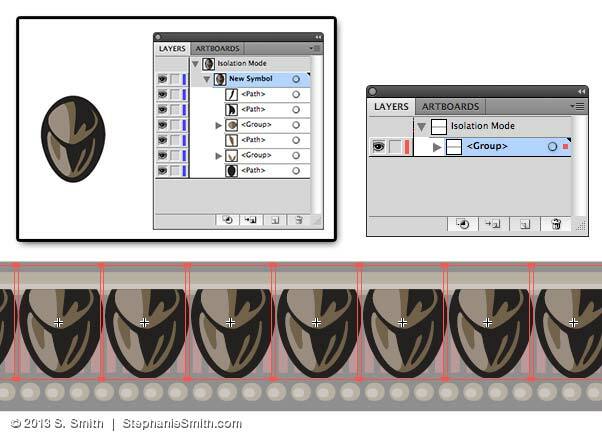 Keeping everything on separate layers make it so much easier to make changes later if I need to. Adding details to the color is next. At this point I put an approximation of the final background color in, because a plain white background makes it very hard to figure out the correct tonal range and color balance. Now I start adding shadows and highlights on separate layers. This is where it really starts taking shape. I always use the shading I already included on the ink drawing as my guide, but because I knew I’d be adding shadows at this step I didn’t do much crosshatching where the more subtle shadows would be. Next it’s time to consider the background. The leaves were all colored separately, so I could arrange them however I liked. 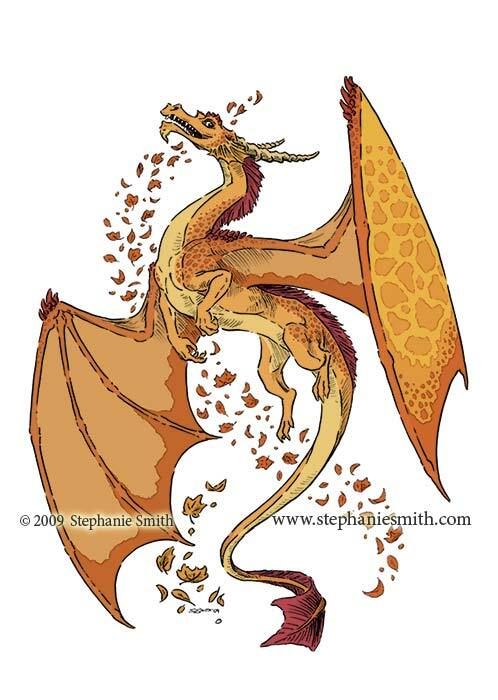 Because my file sizes were getting very large, I built the leaf frame in a separate file and then copied it into the main file with the dragon. 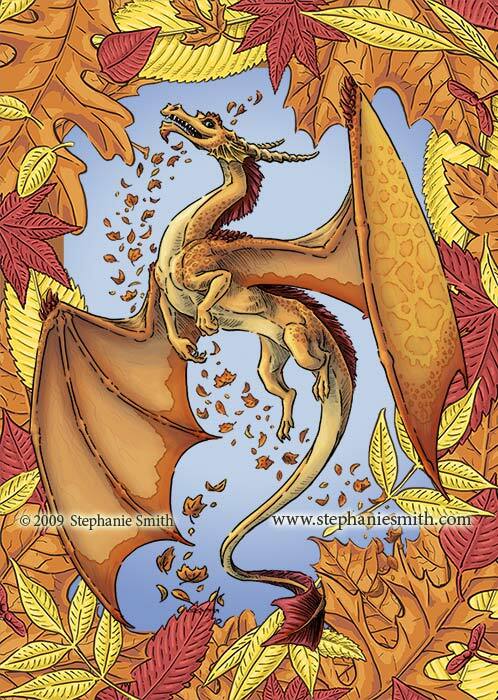 The leaves were overwhelming the dragon, so I faded everything back a little bit to make sure they stay in the background. It’s almost done, but I felt there was something missing. 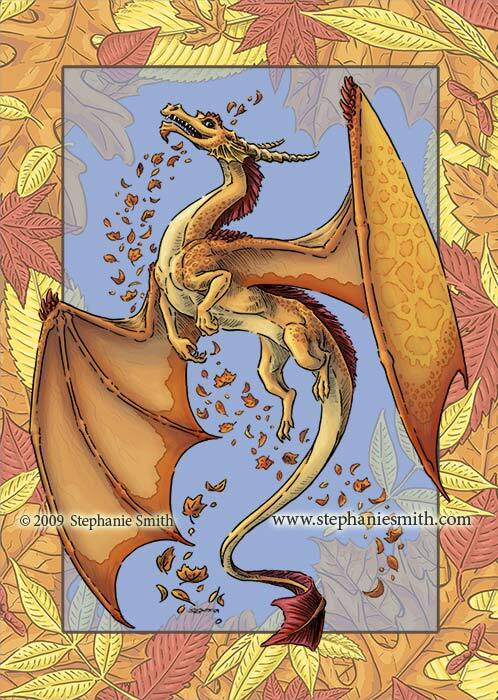 I wanted to add a little bit of texture to everything, to give it the feel of real autumn leaves. 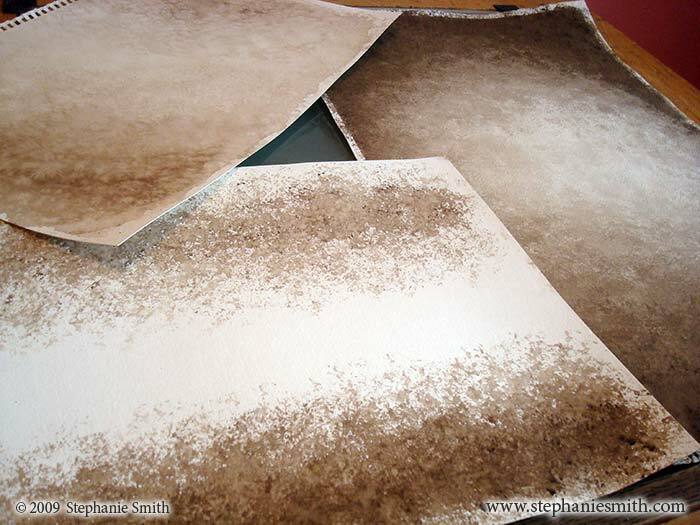 So I broke out my watercolors and made some nice, crinkly textures, which I then scanned in. 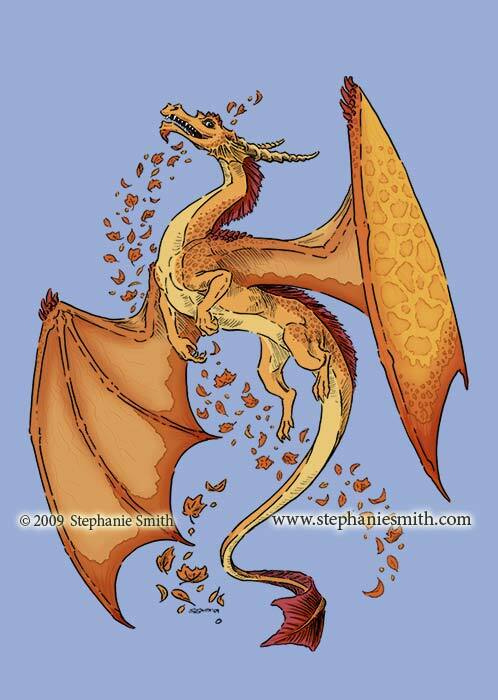 And now, with the textures layered into place, the image is finished! 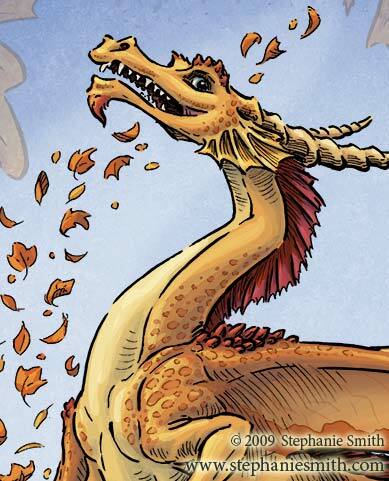 Smile for your closeup… there’s a good dragon! This image is available for sale on prints, cards and T-shirts at my RedBubble site… check it out! I really like working the textures into my ink drawings, I think it adds a dimension that was missing before. 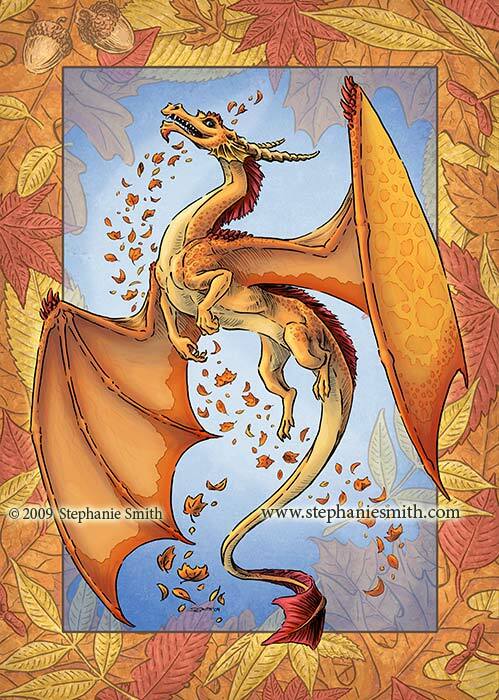 I also liked working with really bright, vivid colors instead of soft tints all the time. I really need to invest in a new computer, my little Powerbook was gasping as I was creating all of the colors in hi-res and the extra layers from the texture files didn’t help matters. By the end the file was taking almost 20 minutes to save. For most of my color illustrations, I have downsampled the scan file to a lower resolution to make the colors, and then upsampled the finished color layers back into the full-resolution ink scan. The full-resolution color file tends to be massive (this one would have been well over 1GB if I’d kept everything in a single file) and that approach minimizes how much I have to work with such a huge file. The drawback is that the upsampling softens the colors a bit giving them a watercolor feeling I don’t always want. This time I tried to do everything in the high-resolution file so it’d stay sharp and bright, but it made my computer run painfully slow. 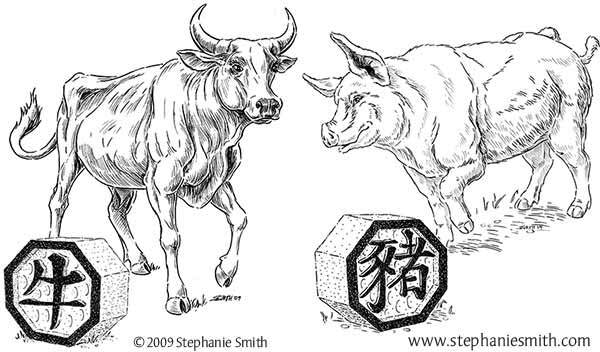 This was a little divergence from my zodiac series, but it was a refreshing one. Now, back to work! UPDATE: If you just can’t get enough step-by-step excitement, I’ve also made an animated GIF showing this sequence… in motion!